Let's start with the publishing nonsense that won't matter by the time we're all watching Avengers: Endgame. This issue's title page notes that it takes place after Mr. and Mrs. X #10. Which won't be published for another two weeks. Marvel's classic organizational skills - "we publish comics but not, like, professionally" - strike again! I don't think Captain Marvel #4 suffers much from the missing context. Rogue's story is a bit disjointed - in Mr. and Mrs. X #9, she was on an optimistic trajectory - but this is, after all, Carol's story, not Rogue's. And this is quite an exciting chapter of it! The Carol/Rogue backstory is summarized with admirable brevity. I like the way the art and words work together to enrich Carol's thoughts on the relationship. The visuals are packed with subtleties and allusions, but the narration is brilliantly focused on the here and now. The order of the day is conflict, and it injects tremendous vitality into this issue. Hopefully, I'm not spoiling it if I confide that this issue delivers not one but two excellent Carol vs. Rogue bouts. A healthy serving of direct Carol/Mahkizmo interaction also freshens up the overall arc's conflict. It clarifies the stakes, and by the end of the issue, those stakes get raised to shocking heights. While the Carol/Rogue and Carol/Mahkizmo relationships are the stars of the show, the supporting cast is far from sidelined. Thanks to the leadership Captain Marvel provided in previous issues, her army marches on without her. There are particularly powerful scenes lined up for Jennifer Walters, and hero-ing without her Gamma alter-ego works out wonderfully for her. The women of the Rebellion orchestrate this issue's quiet meeting scenes, and Carmen Carnero's art indulges in more excellent emotional work here. Fatigue and resolution are clearly at play, thoroughly humanizing the heroes. That's not to say the visuals are in any way disappointing in the book's action scenes! 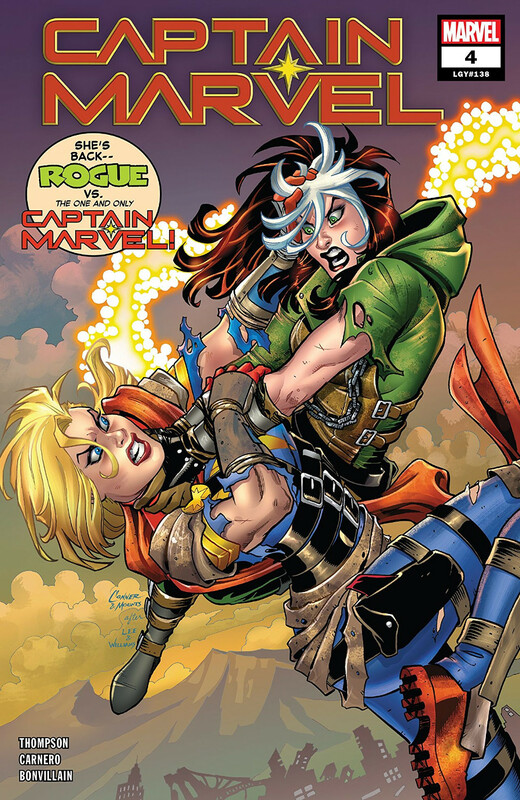 The Carol/Rogue fights are tremendously visceral, with no punches pulled in either the scripting or the art. This issue is simply brimming with awesome drawings of awesome women throwing awesome punches, and that's exactly what Captain Marvel should look like. Tamra Bonvillain's palette is still constrained to the muted colours of a standard-issue post-apocalyptic wasteland. Her work isn't shortchanging the characters, though; every great panel in this book is great not just because of the lines but also because of the nuanced depth provided by the colours. Ms. Bonvillain's work is also critical to creating an impressive and all-new portrayal of Rogue's powers. And this issue - I hope, again, this isn't too spoilery - delivers another magnificent Binary moment where plot, art, and colours combine to get you cheering for Carol. As mentioned above, Carol's narration has a powerful immediacy when it discusses her relationship with Rogue. I think Kelly Thompson's script tackles a nigh-impossible challenge here: Evolving the Carol/Rogue relationship in a way that satisfies both newcomers and super-fans. This issue masters the challenge so thoroughly that the sheer stature of the accomplishment risks being overlooked. I think whether you come into this "grudge match" issue with the highest of expectations or no expectations at all, you'll be entertained and delighted by the work on the pages. Captain Marvel #4 energizes the ongoing story by focusing on conflict. Both the writing and the art leap boldly into combat. The headliner fight between Carol and Rogue is unmissable on its own, but the attention paid to Mahkizmo and the Rebellion is rewarding, too. Although one of its strongest accomplishments is ratcheting up anticipation for the climax in #5, this issue is formidable and fully satisfying by itself. The Rebellion's Air Corps is maybe shorted on page space, but where they do appear, those warbirds are notably beautiful.